It is powered by 1.4GHz Dual Core processor. There is 1GB RAM along with this performer cpu. 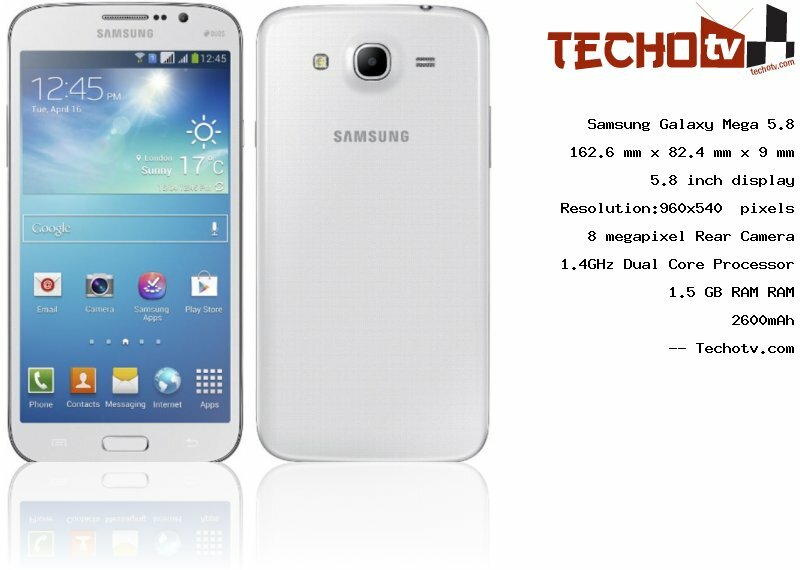 Samsung Galaxy Mega 5.8 has 5.8 inch display sporting resolution of 960*540 pixels. The pixel density based on resolution is 190 ppi. This device has physical dimension of 162.6 x 82.4 x 9 mm. We've 8 GB storage as internal storage capacity on this device. There is 8 megapixel primary camera situated at the rear of this phone. On the front, we've 1.9mp camera. Sorry, The price of Samsung Galaxy Mega 5.8 is not available at the moment. Our team is keeping an eye on online stores to get you the latest price as soon as available. Samsung WatchOn to convert this android phone into universal remote. S Translator, S Memo, S Planner, S Voice 2.0, Air View, Group Play, Multi Window, Pop up Play, etc. Sensors - Accelerometer, proximity, RGB Light, gyro, geomagnetic.